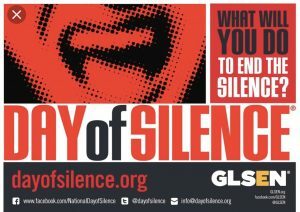 Bulldogs News · Apr 11 Trimble Tech’s GSA Club joins other schools in support of the Day of Silence, on April 12th. 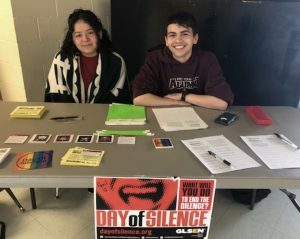 Trimble Tech’s GSA club decided to join other schools in the district and in the country in support of the Day of Silence on April 12. 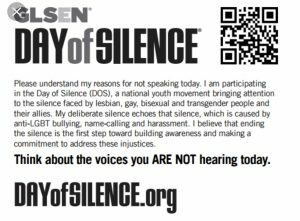 The Day of Silence is a national movement to highlight the silencing and erasure of LGBTQ students in schools. Tech’s GSA club wants everyone at Tech to know they are accepted and supported and that they don’t have to be silent. Nationwide nearly 4 in 5 LGBTQ students don’t see positive LGBTQ representation in their curriculum, nearly 8 in 10 experience verbal harassment, and almost a third miss school for feeling unsafe or uncomfortable. Tech’s GSA doesn’t want our students to fall into those statistics. Every student that is silent on April 12 speaks volumes of support to our LGBTQ students. Too often LGBTQ students remain silent because of fear of discrimination, harassment, and prejudice. For some, that fear becomes too much and they choose to become silent permanently. At Tech we are thinking about the voices that we don’t hear and together we can break the silence and let our students know that they can speak up and be themselves. 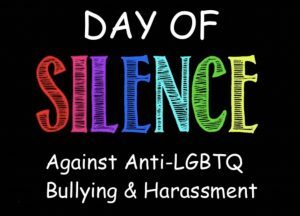 The GSA club has been providing their fellow students that want to participate with wristbands and speaking cards to wear and use on Friday so that everyone knows why they aren’t speaking. The more students the club gets to take the vow of silence the more our students feel safe and supported! Thanks to Coach Shay Eskridge for the write up. Here is a YouTube Link that has some more information.